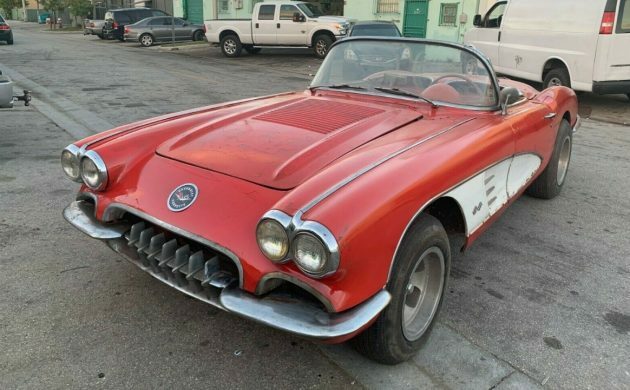 A numbers-matching 1958 Chevrolet Corvette that is for sale in a No Reserve auction! Okay, now that I’m pretty sure that I have your attention, I can tell you that I’m not joking. 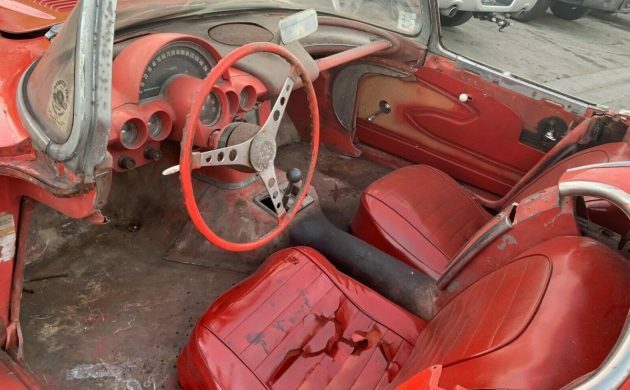 This 1958 Corvette is being sold in a No Reserve auction, but it will require a full restoration. 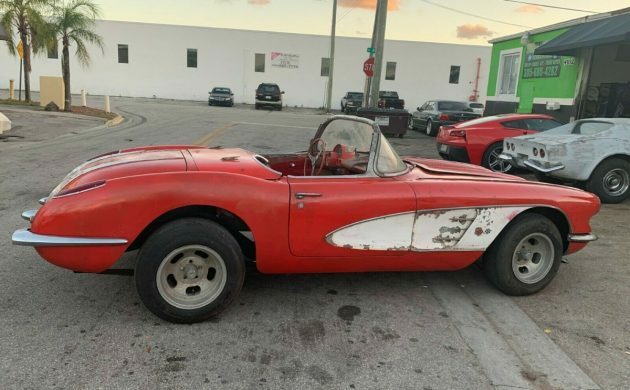 If this is a car that you really want in your workshop, it is located in Miami, Florida, and is listed for sale here on eBay. Details and photos are a little bit sparse on the Corvette, so we need to work with what we’ve got. The car has been owned by the same person since 1963 and has been in storage for virtually all of that time. The owner says that the car has a solid frame. 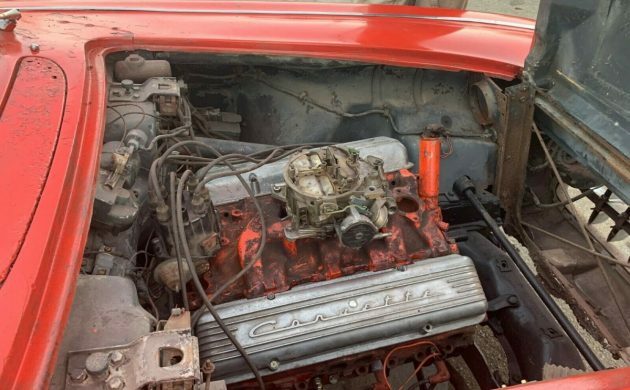 However, I can see some rust present in the radiator support, and also some minor rust visible near the bottom of the windshield frame on both sides, so the car is going to require careful inspection. I’m also not sure if it’s just me, but the door fit into the frames looks to be a bit off. The Corvette has obviously been the recipient of a repaint at some point, and it hasn’t been a good one. Still, when the owner says that the vehicle requires a full restoration, I guess there’s going to be plenty of work to do. The car is a full numbers-matching vehicle, which means that it’s a 230hp 283ci V8 with a manual transmission. Once again, the owner isn’t terribly forthcoming with information, so I can’t be sure whether the transmission is the 3-speed or the optional 4-speed. 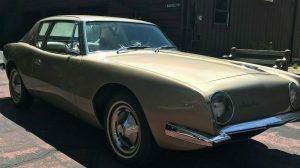 Regardless of which it is, the important fact is that it is a numbers-matching vehicle, although since the car has been sitting untouched since the 1960s, you can guarantee that there will be plenty of work to do. 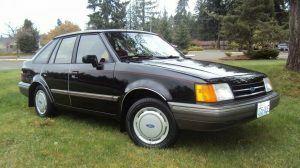 It’s also worth noting that with five different engine specifications available, nearly half of the entire production featured the standard 230hp engine, and the 3-speed manual transmission was the most commonly used. As with every other aspect of the Corvette, the interior is going to take some time and money to set right. Thankfully, it is largely complete, although there are some notable items missing, including the aluminum trim off both door trims. The soft-top is present, but given the fact that it appears to have been folded down for more than 50-years, I suspect that it will probably need to be replaced. Thankfully, all of the gauges and the clock look to be present, as is what looks like the original Wonderbar radio. 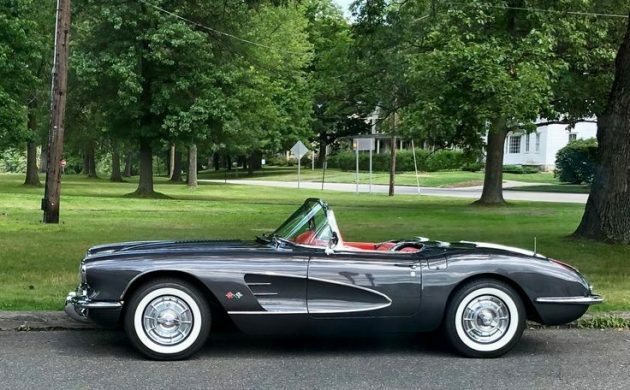 With 9,168 cars produced during 1958, the Corvette is not the rarest car on the planet, but that doesn’t prevent it from being highly desired. Values have remained steady for them in recent years, with no major spikes or drops. Good examples will still fetch over $60,000, while it isn’t unusual for immaculate examples to sell for at least twice that figure. At the time of writing, bidding has reached $24,156 in this No Reserve auction. More significantly, there are also 152 people watching the auction. So, let the battle begin. These C 1’s do not usually interest me a whole lot for some reason. I like this though. I’d clean up the interior, get the mechanicals straightened out and drive it as I restore it. I’m afraid to use the word “patina” but I like the tired look of the exterior. I agree. I like the look of this car – it looks like a brawler, not afraid of anything. I appears someone spray painted the door trim and seats. They probably used upholstery paint but still not a great thing to do to a car like this. thats a lot of orange spray bomb paint wonder what they are hiding ?? I’m guessing its been in a flood or 2! Just a guess though! It this is numbers matching, the Quadrajet was not introduced until 1965. The door trim is missing off the door panels. Whenever I see these I remember the 60s Tv show ‘ Route66 ‘ starring Martin Milner & George Maharis ! I just love old 60s and 70s Tv shows ! The scene in True Lies where Arnold takes a test drive with Bill Paxton. I’m sure Vette guys are pulling their hair out, shouting ‘That was a ’59!’ But they look the same to me. Not sure of the year Corvette in the movie Hotrods to Hell. But it reminds of that car. Saw Hot Rods to Hell when I was 7. We watched it right before a trip to Las Vegas. I tell you, I usually slept on the way, but the fear of running into those rabble rousers kept me on silent watch all night! Dang it’s had a rough life in as many years on the road…yet…to be stored so long ? As couple of the guys said, I like the way lt looks the way it looks as is on the exterior. Spiffy up the gut. sad that there are no pics on the underbelly. Caveat Emptor, Check the frame and birdcage. Good luck to the new owner, someone is going to buy it!!! Bidding is up to $25,400. Well, that Quadrajet sure is not a 1958 unit. and yes, the car is a 1958, the dead giveaways are the louvered hood, and the chrome spears on the deck lid! I am at a loss for words. That poor girl has been sitting outside for a looong time. Rusted cowl vent, broken fender, wonky hood, goofy front engine mount, reversed shackles, two lugs on the wheels, missing hard top…whew. And it will probly sell between $30-35k. Y’all know as well as I there are “vette” people out there with all the parts etc. that can have this car fully restored in 90 days. We restored a 68 Charger RT found in a field took 3rd place because we put reverse steel rims with baby caps in 90 days. In a 2 car garage It can be done. 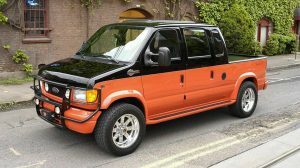 2 brothers owned a grocery store near our house and one called Lucky bought a brand new one of these in the same color. When I went to the store for a candy bar I used to stop and just stare at that car and said some day I will own one. That day never came. That guy was named right LUCKY. My dad had a black 58, with the base engine and 3 speed. He’d wired the spears on the trunk as his radio antenna. As I remember it, they worked fine! Years before anybody had put them into the window glass. Looks to me like it has been submerged under water. 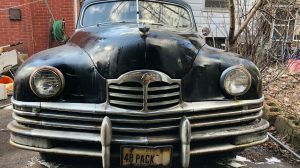 All parts are out there to restore but unless you can and like to do all the work you could buy one ready to drive for the same or less than you would have in this one. This will be appearing at next year’s BJ auction in Scottsdale as a resto-mod. Sad, IMO, but that’s what’s happening in the C-1 world right now. I have a 59 that was a failed drag car. 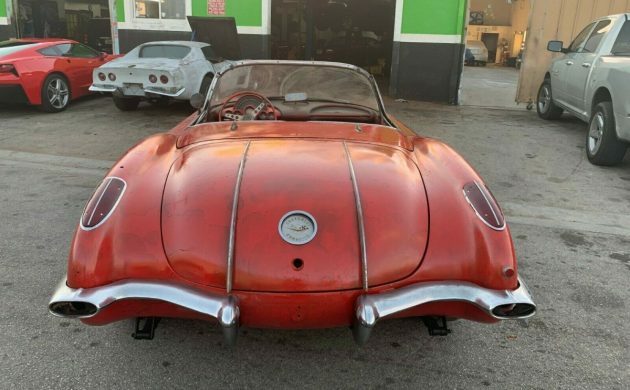 People asked if I was going to restore it…..no, that would be a fools errand. But I for a $2200 buy in and another $15k, a lot of time, judicious shopping here and Ebay, and I will have it built back for a fun driver by next summer. It does not need perfect parts or more than a base crate 350 to be enjoyed as a father and son project. It got a C4 rear end, C5 calipers on the front, basic interior and will get a decent paint. Not every classic has to be restored to Pebble Beach standards. Most would consider it a waste, but I’d love to drop that body on a SRII chassis with and LS3/T6. Sort out the interior with some quality used bits and be done with it..
An original good red steering wheel and good original trunk chrome strips are the hardest thing to find for this. The engine rebuild and missing parts under the hood look around $6k. The frame will need to be dunked and done if what shows looks like that , but a new one probably will be needed. The chrome bill will be $5k on the original metal. A good new interior with instruments will be 6k if the seat frames are good . ( Those aren’t the original covers) Windshield details can be a problem, but everything else can be easily bought and done by one guy in 5 years of spare time! 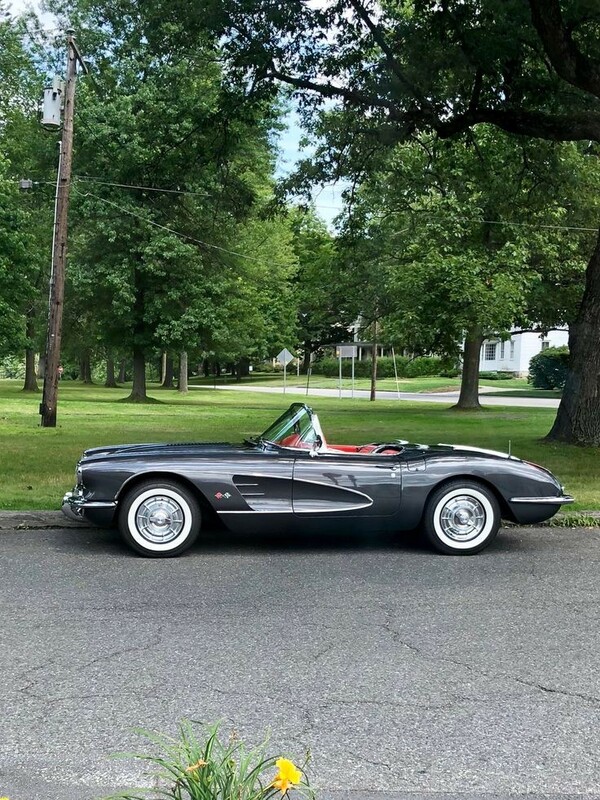 I have always loved most any vette made before the 70’s. This is a stunning body style. I will have to not get in on this one. Too many hungry bidders, and I know a couple of them. my friend had a 58 in the 60’s and it was a junk noisy not comfortable ride was hard on your back,no thanks I would pass. But I did buy a new 1967 427 435 horse 4-speed fast back sting ray in 67. fast car nice ride but hot in summer with them sidepipes. I wish I kept that one. 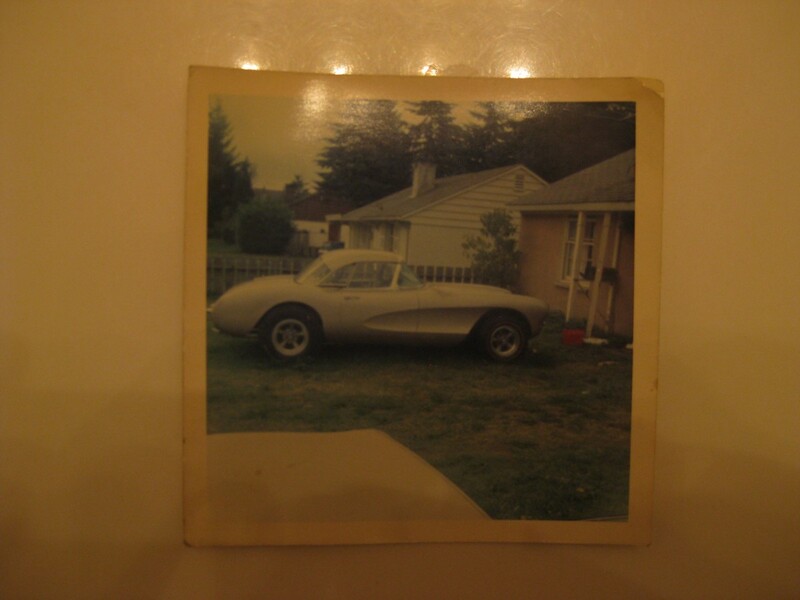 My ex and favorite Corvette and it’s a ’58. More “styling ” (goo) to excess, or a stripped base car does it for me with nothing in between. A beautiful car beautiful styling I’m obsessed with 58 automobiles as that was the year I was born. 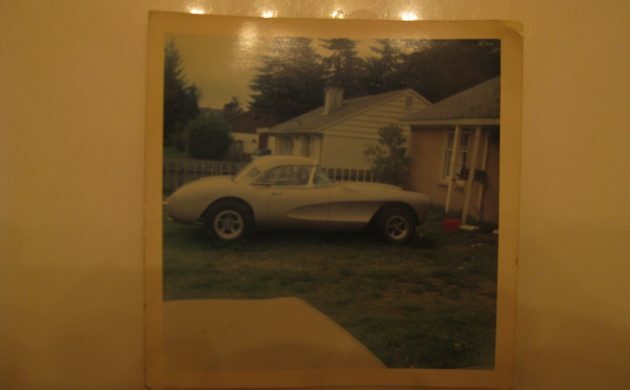 I have always dreamed of having a 58 Corvette and or a 58 Impala, however they have been elusive as I could never put the money together at a proper time to purchase one I still have a few years left Maybe it will come true as for this car I don’t think it’s that bad yes it will take a good amount of work but as far as I know everything should be available for it good luck to the new owner I hope you have a smooth restoration ahead and you do not discover anything devastating. Thanks barn finds for posting such vehicles it’s a pleasure to view them.